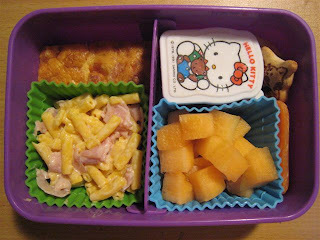 Faith, however, took in the last of the quiche, a macaroni salad made with leftover mac&cheese and ham, canteloupe, carrots, vanilla yogurt and a few koala cookies. She must have been hungry, absolutely nothing came home and this is slightly more than I usually send. just found your blog thru sandersclan. I LOVE HELLO KITTY!